MCB Bank has the Second largest ATM network with 1100+ ATMs including more than 100 off-site ATMs placed at commercial locations like malls, hospitals etc. for consumer’s convenience. The network covers more than 430+ cities across the country and is constantly growing. MCB Bank has one of the best ATM up times across the industry, ensured by the presence of ATM monitoring teams working 24/7. We are also proud to be the one of the few banks to have our entire network installed with anti-skimming devices which helps in safeguarding customers. 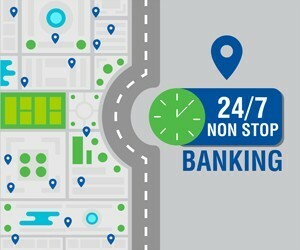 MCB ATMs provide our customers with 24-hours of convenience to withdraw cash (up to your daily limit), transfer money between your accounts, make bill payments, and credit card payments (for MCB Credit Cards only), get mini-statements for your bank and credit card accounts, and much more. MCB Bank is also proud of the fact that it is one of the few selected banks in Pakistan that offer its customers with the services of Cash Deposit Machines (CDM). They are a quick, easy and time saving alternative to standing in queues for making deposits in branches. All our CDMs are available 24 hours a day and offer instant credit to your account. At our CCDM’s, you can make deposits , withdraw cash (up to your daily limit), transfer money between your accounts, make bill payments, and credit card payments (for MCB Credit Cards only), get mini-statements for your bank and credit card accounts, and much more. PIN change option is now given so that you can have added security with your MCB card. For added security, it is advised to change the PIN as soon as you receive your MCB Card. It is also advised to keep on changing the PIN on a regular basis. In case your MCB card is lost, please advise your MCB Branch or Call our 24-hour MCB Bank Call Centre at 111-000-622. If by any chance the Automated Teller Machine (ATM) or the Cash Deposit Machine (CDM) does not dispense the correct amount of money or does not dispense the money at all, please contact the branch where you were using the ATM/ CDM or your Branch and inform them immediately. You will have to complete a “Transaction Dispute” form (also available online) and the amount will then be credited to your bank account. It is advisable to keep your Automated Teller Machine (ATM) receipts after every transaction. It is a good way to guard against fraud and make record-keeping easier.